Some personnel news to report in the front offices of the Gary-SouthShore RailCats (independent; American Association) and the Acadiana Csne Cutters (summer collegiate; Texas Collegiate League). David Kay joins the RailCats as Assistant General Manager and Director of Tickets for the 2014 season. This will be David’s 9th season working in professional baseball. He most recently served as Director of Tickets for the Tulsa Drillers (Class AA; Texas League); before that he was Director of Tickets with the Arkansas Travelers (Class AA; Texas League) and with the Carolina Mudats (Class AA; Southern League). Kay was promoted to Assistant General Manager of the Arkansas Travelers in 2008 – a position he held through 2012. The Acadiana Cane Cutters added Bill Levy as the team’s new general manager. Levy comes to Acadiana from the Augusta Greenjackets (Low Class A; Sally League), where he served as the group sales manager. He has been in minor league sports, primarily affiliated baseball, for the last 20 years. Originally from Wilmington, DE, Levy has a BBA in sports management from Robert Morris University (PA), and a Masters degree in Education Administration from Delta State University (MS). 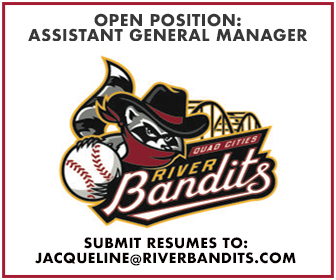 Tis is his second GM role, as he led the day-to-day business efforts for one season of the Columbus RedStixx (Low Class A; Sally League), before they relocated to Lake County, OH, and became known as the Captains. Levy, who moved along with that franchise, worked a total of five seasons in a couple of different roles for the Captains.